A couple all right boulders are north of Castle Rock on Skyline Blvd. They are the same Vaqueros Sandstone and have a few worthy problems each. 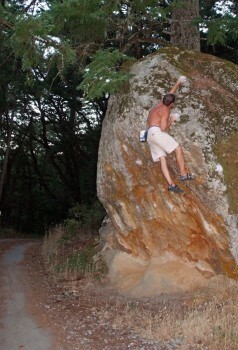 The first boulder to the north of Castle actually hangs over the east side of Skyline Blvd. The Funny Face Boulder may be a roadside pile but it has a couple fun problems and a scary highball on its steep main face. It also has uncertain access. Don’t get too close to the road when doing the Hueco Arête and generally try to be inconspicuous and respectful and it should be all good. The other boulder is actually quite classic, The Alpine Boulder is on the side of the pleasant Alpine Pond with the flat Alpine Pond Trail as a landing. The first ascents were done by longtime locals Dave Caunt and Bruce Morris around the early 1990s. There are currently there are no beta messages posted for this bouldering area. Be the first! Which SuperTopo guidebooks cover Skyline? Poser on Alpine Arête (V4) Photo by Sean Brady.